Logan has been obsessed with Pokemon this year so it was really no surprise that he wanted to be Ash Ketchum for Halloween this year. And I nailed that costume! Really... stay tuned for a post about how I made it coming soon. 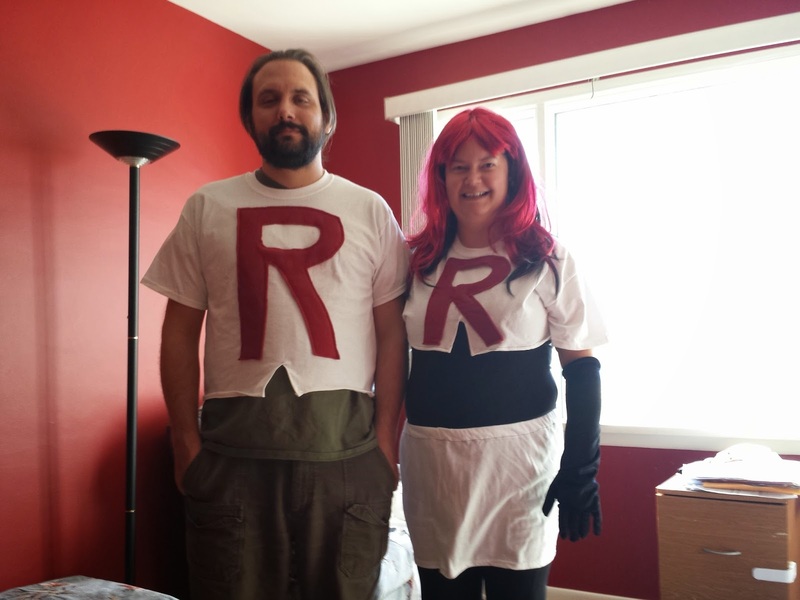 But today I'm going to show you how I turned me and Terry into Team Rocket. Since Logan is going to be Ash, we figured he needed the Pokemon "bad guys" hanging out with him on Halloween night. 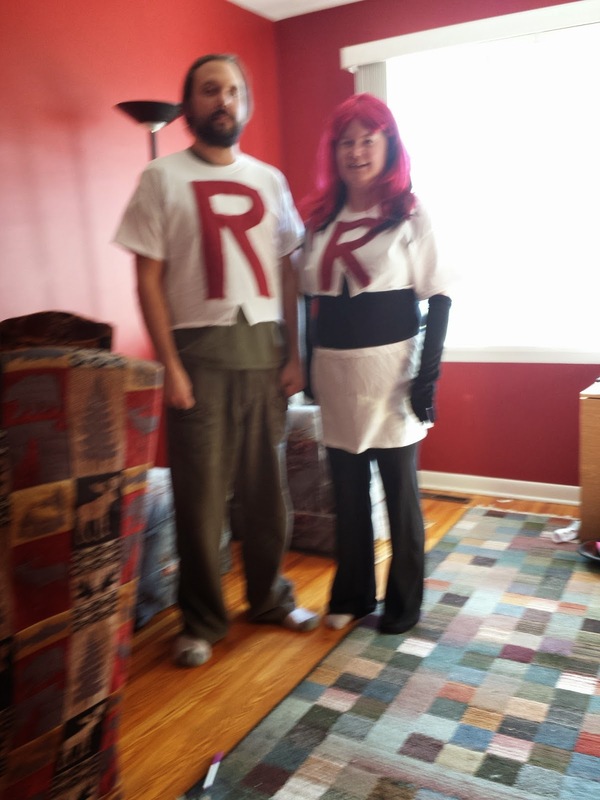 In case you weren't sure what Team Rocket looked like, here they are. As you can see, Jessie is a typical anime woman - impossibly tiny and not wearing much. ACK! Since we would mostly be hanging out with children this Halloween and since I'm a normal sized girl, a mother and in my 30s, there is no way I was going to do the bare midriff thing. Basically for the costumes I bought 2 large white t-shirts for $6 at Michaels. For Jessie, I cut the t-shirt so that it would be short and sewed a red fleece R on it. I hemmed the bottom with the little v-groove thing in the centre. Then I took the bottom of the t-shirt I cut and made an elastic casing and threw a bit of elastic in for a skirt. I'm wearing black yoga pants and a black tank top underneath. I bought long black gloves from the Value Village. For the signature green earrings I found some small earrings that I don't wear anymore and hot glued large, round green beads to them. We then went to look at all the fun Halloween stuff they had in the old Future Shop on Regent and found a raspberry red wig to wear to complete the look. For James, I just cut the other t-shirt a bit shorter and sewed a red fleece R on it. Then I hemmed it with that same v-groove in the centre. Terry looks really enthusiastic about being James doesn't he? Oh well. We bought some blue hairspray stuff to colour his hair with on Halloween if he wants to. 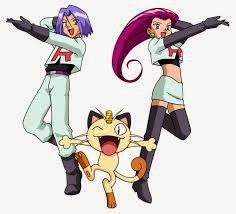 And he can carry our Meowth around to make the costume work better. Logan was taking the pictures for us, so forgive the blurriness - he was busy trying to swat his sister out of the way when he was taking these. 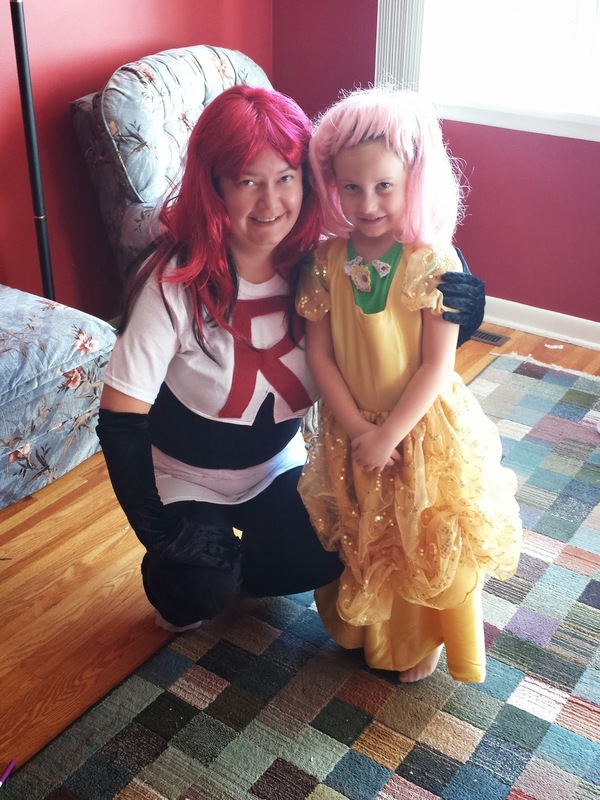 Although Lane is being Princess Belle for Halloween, she wanted to get in on the Pokemon spirit (and wig wearing) spirit with us while we were taking photos. 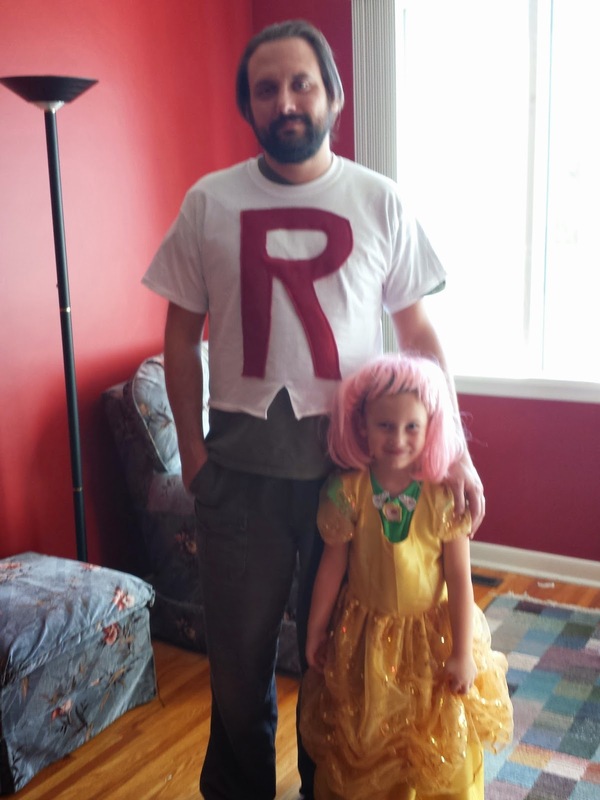 We decided that this look - complete with borrowed pink wig from me - is the Princess Pokemon Gym Leader look. Doesn't she look cute posing with James? And here she is posing with Jessie. 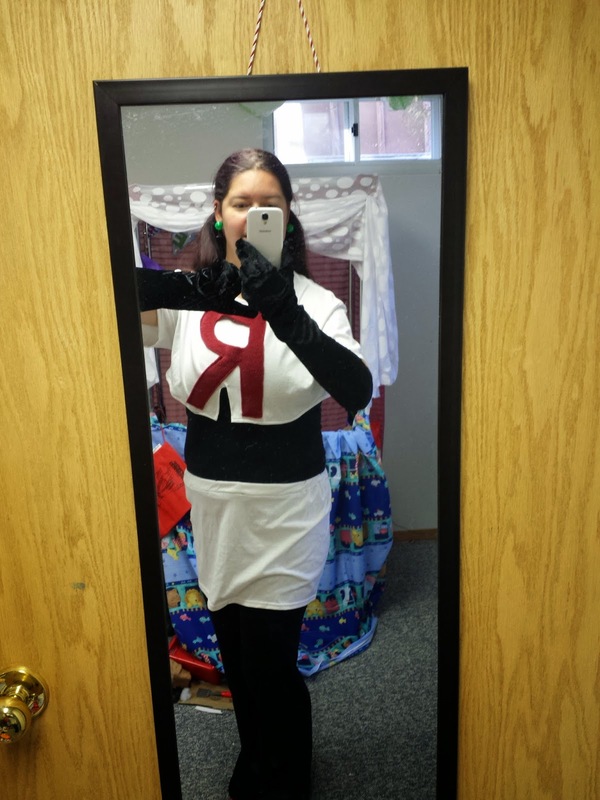 And we couldn't be Team Rocket this year without our trusty Meowth. I used this free pattern to crochet Meowth. He worked up really easy and looks really cool. 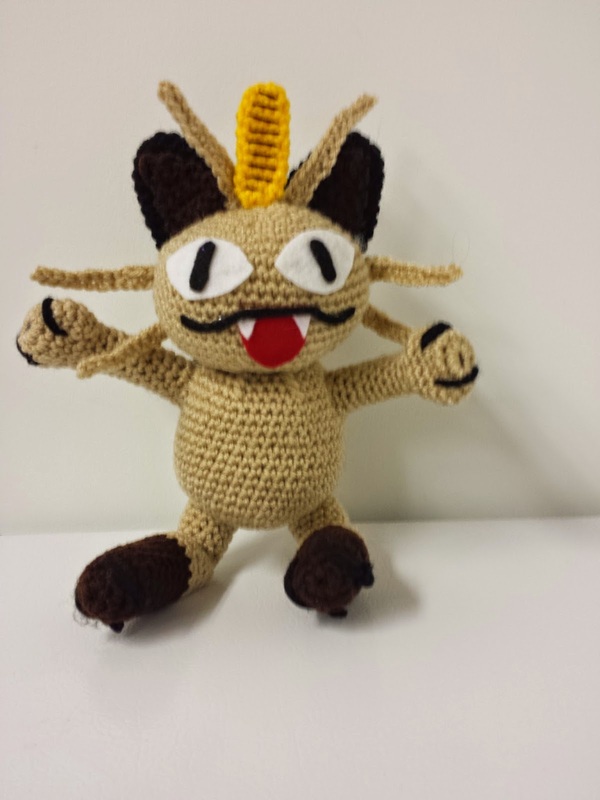 A link to my Meowth project on Ravelry.